Dhantala, Nov.7: A farmer from Nadia’s Dhantala has made an appeal to chief minister Mamata Banerjee, Director General of Police and Nadia’s police Superintendent requesting them to arrest a person, accused of fatally injuring his wife by throwing acid along with his father, as the Dhantala police did never bother to arrest him even after one year of the incident despite his name figured in the FIR and repeated court orders, while continuously threatening the victim to withdraw complaint unless face more serious consequence. Nirapada Parui (49), a resident of Halalpur village in his letter sent last week has also requested them to save his neighboring relatives, who are witnesses of the acid attack from hands of accused Bijoy Biswas, who has unleashed a reign of terror intimidating them of dire consequences. Police, nevertheless, even bother to take complaint. 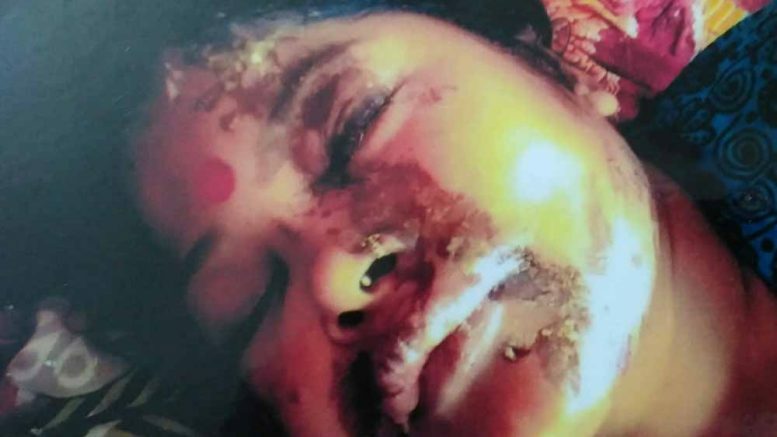 On May 20 last year, Bijoy (31) and his father Binoy Biswas (56), both goldsmiths by profession, had thrown sulphuric acid to Nirapada’s wife Rupali (37) while the couple was plucking flower in an orchard with other farmers during early hours of morning. Rupali was attacked apparently because she refused to accept an indecent proposal by BInoy. The attack robbed her vision in left eye while injuring her back and the other eye fatally. At present she could not even sleep or sit comfortably. A medical board declared Rupali disable over 50%. The state government paid her compensation of Rs.3lakh, but made no arrangement for her rehabilitation. At present she is undergoing treatment at a private eye hospital in Barrackpur. Elderly Binoy Biswas arrested on seven days after the attack on the basis of complaint by Nirapada. But, police never arrested his son Bijoy, despite specific complaint. “All the farmers who were plucking flower in the field on the morning had seen both Bijoy and Binoy thrown acid on my wife. I lodged specific complaint, but police mysteriously allow him to roam free. His name was not even included in the charge sheet. The court also directed the investigating officer to arrest him, but it done nothing, while he has been continuously threatening us. He also threatened to kill my wife and son who is a student of class 11 unless we agree to settle the matter out of court. Police never came to help us”, said Nirapada. The intimidation increased since Binoy got bail recently due to lapse by IO, he added further. “The court then set November 13 as fresh date for his appearance. But, police had shown him as absconder. This made the court angry and “astonished”. It directed IO and SP Nadia to ensure Bijoy’s appearance on December 8 or to issue arrest warrant”, added Mandal. Angry with the role of investigating Officer SI Bapi Dhar, the ADJ said “…if this happens on the part of investigating officer in a case like this, the motto and purpose of legislation will be frustrated”.